"Our fifth grade is working on a project to collect and box up donated toiletries for homeless individuals and people living with AIDS. 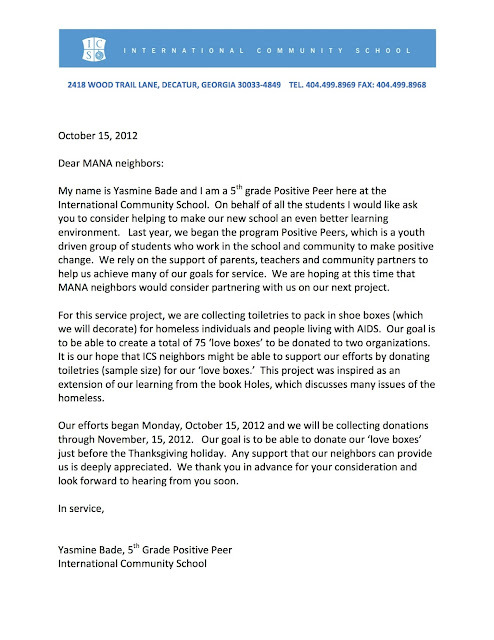 One of the girls who is leading the project wrote a beautiful letter to reach out to businesses and other volunteers. That letter is attached. Items can be brought to the school during the coming weeks, but it seemed to make the most sense to try to make it easier and collect the items at [the October 22 neighborhood] meeting. Please let me know if you can help with this. Thanks so much. "